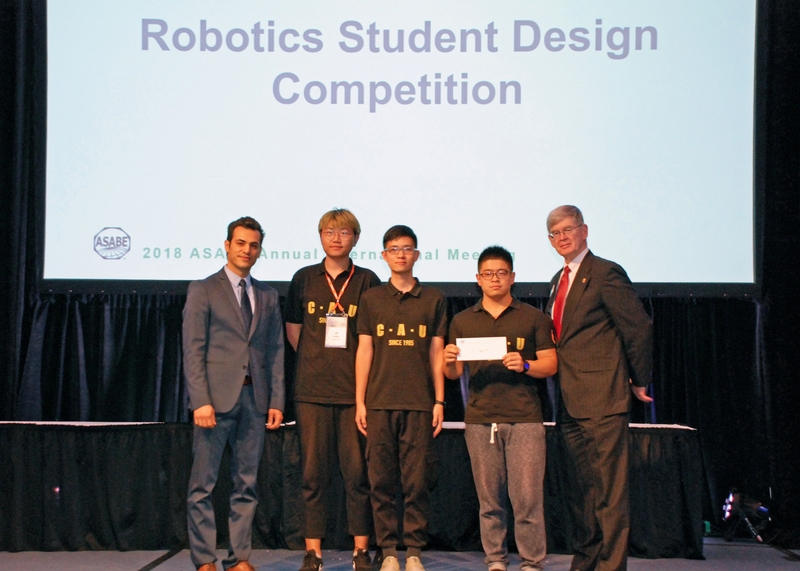 Ali Pourreza, left, congratulates China Agricultural University associate professor Xin Wang and the CAU Dream Team, winner of the 2018 ASABE Robotics Student Design Competition advanced division. ASABE President Steven Searcy joins them on far right. Among the advanced teams, the University of Georgia, University of Florida and UC Davis finished second, third and fourth, respectively. 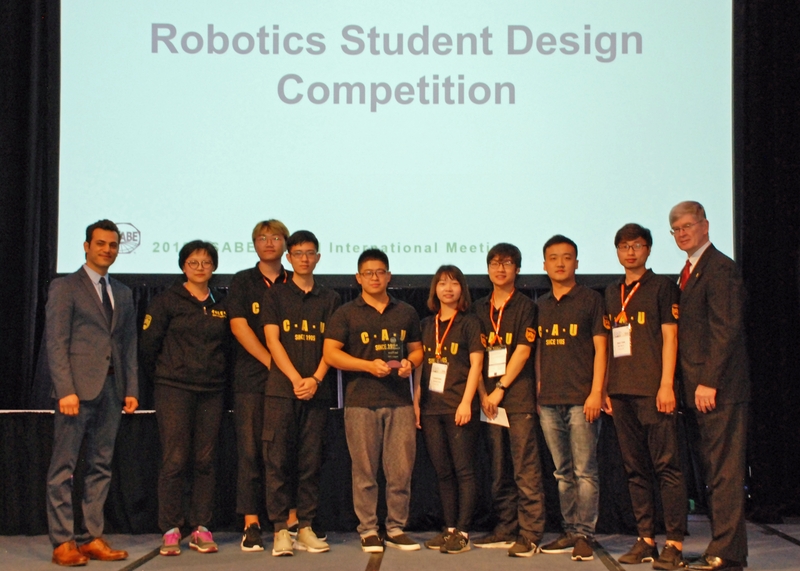 Zhejiang University and Clemson University claimed those runner-up spots among the beginner teams. The beginners' race was especially tight, with the top two teams achieving perfect scores. CAU used speed to edged out Zhejiang, completing the required technical task one second faster than Zhejiang. Teams from Cal Poly (6th place) and UC Merced (7th place) also competed on the beginners board. 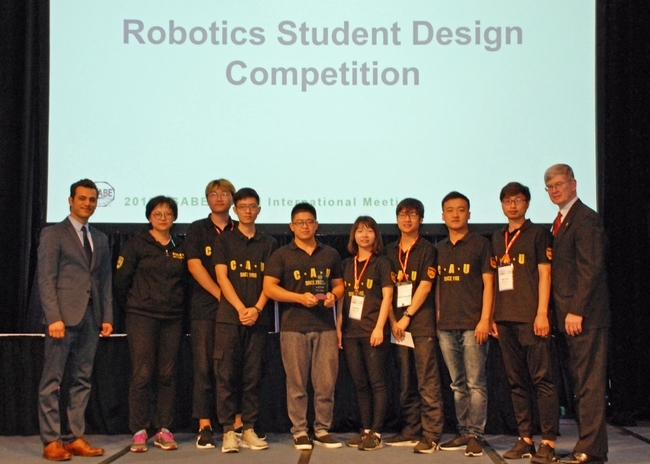 China Agricultural University also won the beginners division. This year's challenge involved identification, sorting, and harvesting of apples. The robots were required to autonomously harvest “apples” on a field measuring 8 feet by 8 feet. The robots identified and selected eight mature apples (red ping-pong balls), removed and disposed of eight diseased or rotten apples (blue ping-pong balls) and left eight immature apples (green ping-pong balls) on the tree. CAU Dream Team's robot picked "apples" in two lanes at once. Photo by Michael Gutierrez. 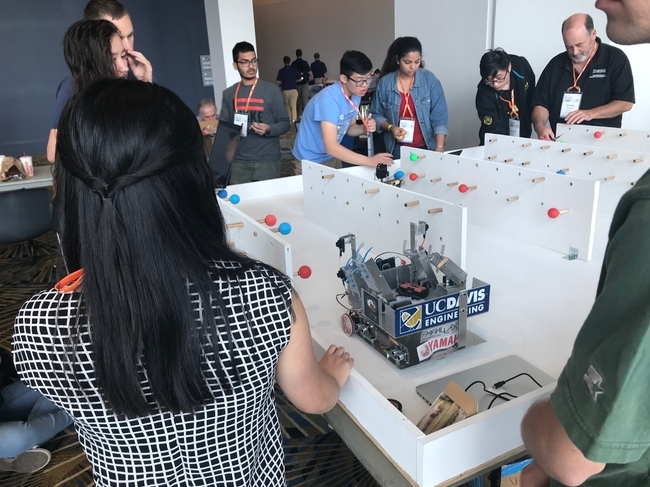 Cal Poly, UC Merced and UC Davis also competed in the 2018 ASABE Robotics Student Design Competition. Fifteen university teams from the U.S., Canada and China competed in this year's contest. Sponsored by the American Society of Agricultural and Biological Engineers, the ASABE Robotics Student Design Competition allows undergraduate and graduate students to develop skills in robotic systems, electronics and sensing technologies by simulating a robotics solution to a common agricultural process.